Aboriginal culture in Manitoba – the corner of the earth where the Creator sits – runs deep. From the sacred sites to the enchanting pow wows and the seven cornerstone teachings, there is so much that one could learn even from a single encounter with any aspect of Indigenous culture. There are many opportunities for gaining deeper insights into this way of life. In recognition of Aboriginal Day, we’ve come up with seven unique ways to experience and celebrate Indigenous culture. There is arguably no better place to start discovering a culture than through its culinary fare and Indigenous culture is no different. And Feast Café Bistro, at the corner of Ellice Avenue and Sherbrook Street is the perfect place to start. This dining hotspot focuses on Indigenous meals with local ingredients deeply rooted in First Nations culture. But don’t take our word for it; just take a peek at the menu and once you’ve fallen under this culinary spell, then plan a visit yourself! From its supermarket and bakery to its restaurant, Neechi Commons is another great spot to consider for traditional Aboriginal fare. And the great finds aren’t limited to food as the Neechi Niche is full of arts, crafts, and books all related to Indigenous culture. Exploring nature is likely one of the best ways to experience Aboriginal culture and the Brokenhead Wetland Interpretive Trail (Anikanotabijigade) is a great place to start. Not only does this trail possess medicinal plants that are sacred to Aboriginal culture, its shaded boardwalks with trees on either side and open marshy areas offer the perfect place and opportunity for reflection on the teachings of love, respect, courage, honesty, wisdom, humility, and truth, which Aboriginals hold in high esteem. In a world where human rights are always at the forefront of our conversations, the Canadian Museum for Human Rights is a great place to start to explore Indigenous culture, its impact and perspective on such matters. The Mikinak-Keya Spirit Tour at the museum not only ties the building’s design into its sacred teachings, but also connects its oral traditions to the present-day topic of human rights. The Urban Shaman Contemporary Aboriginal Art Gallery is not only the place for Aboriginal artists of all disciplines to showcase their work, it’s a space of discovery and cultivating talent among Indigenous peoples. From its arts and crafts to its abstract exhibits, the gallery seeks to maintain its authenticity and to remain deeply rooted in Aboriginal culture. The Forks has always been known and regarded as an historic site and sacred meeting place for First Nations peoples for over 6,000 years. While in the past it served as a key trading point for Aboriginals, European fur traders, Métis buffalo hunters, Scottish settlers, riverboat workers, railway pioneers and immigrants, it still holds the same significance as the city’s most popular spot and meeting place. A view of the sacred stones of the Thunderbird Nest. Signy Gillis Sizer Facebook page. The underlying theme of Aboriginal culture, it would seem, is one of holding sacred that which is sacred and the Thunderbird Nest site is no different. Just two hours north of Winnipeg, this site, built by the Anishinaabe, was meant to harness the power of Thunderbird guardian spirit. 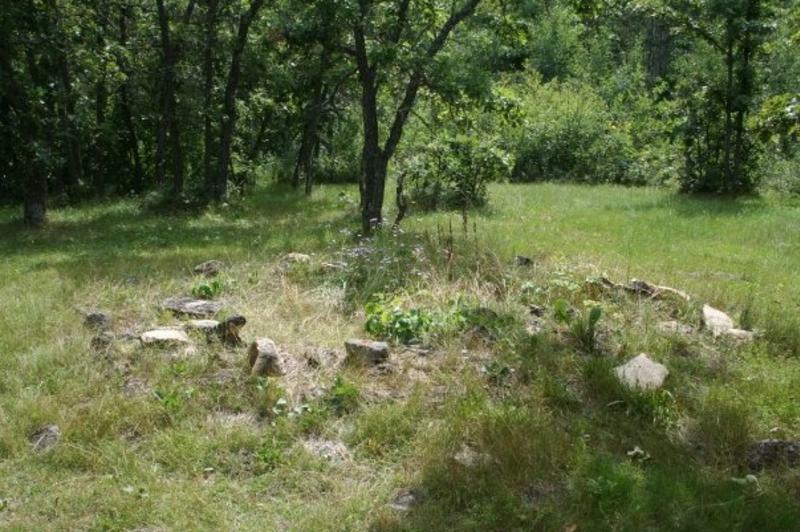 The circle of stones, which still exists today, and is still used by Aboriginal peoples.